Mr Magnolia - Folksy Theatre. Mr Magnolia has many things, such as an old trumpet that goes rooty-toot, some very fat owls learning to hoot, a big purple dinosaur who's a magnificent brute, two sisters who play the flute, and even a swimming pool. But he still only has one boot! 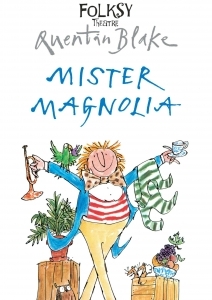 Join Mr Magnolia on his wacky adventures, filled with Folksy Theatre's bold characters, live music, puppetry and audience interaction, it's a day out not to be missed! Based on the book by Quentin Blake.